Last week I watched Clemson trounce Alabama in the NCAA’s Football National Championship game. Clemson was up 31-16 at halftime and never looked back. After a botched fake field goal at the beginning of the third quarter Alabama’s loss seemed imminent. Failure, at least in that game, was coming. Still Alabama did not walk off the field and quit. They played out the game. They stood strong, played hard, and lost. Sometimes failure seems imminent in life. Business ventures, relationships, or careers can seem to be on the brink of total destruction. Failure seems to be on the horizon – just a few minutes away. And life feels heavy, burdensome, like a battle. 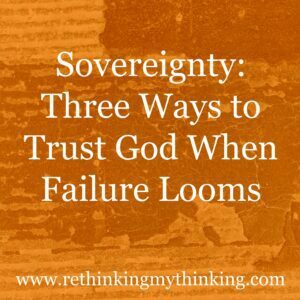 How do we trust God when failure threatens and loss seems certain? 1. We remind ourselves that God is sovereign. God is in control. This does not mean that we are not responsible. Somehow as God works we do too. It is a mystery, but it frees us. It frees us from fear that immobilizes because we can trust God to guide and direct us when our hearts and minds are set to glorify Him. It frees us to do the work God called us to do and leave the results to Him. 2. We remind ourselves that God works all things out for our good. For those of us who are called to God’s purpose, who are in a deepening love relationship with God through Jesus, we can trust that God is using all things – the imminent failure, the painful loss – for good. Sometimes our good is painful, but all things that are deeply important require hard work. 3. We cry out to God and then trust He will answer. Yes, we cry out to God and trust He will save us. He will work out and redeem our souls in our battles. Our battles may not turn out the way we hope. We may still sustain loss, but we know we can trust God. May we cling to God’s sovereignty, trusting His ways, and calling out to Him when failure looms and losses weigh heavy. This entry was posted in Rethinking Christian Life, Rethinking Hard Times. Bookmark the permalink.